VA has more than 115 events scheduled across the country to honor Veterans who made the ultimate sacrifice in service to our nation. Because of these courageous Veterans, we enjoy the opportunities and freedoms that we have today. For a listing of events by state visit: http://1.usa.gov/1oLZgJU. 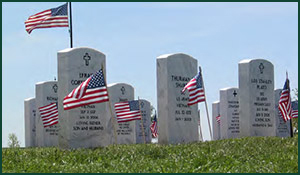 Join VA in honoring our heroes this Memorial Day! #VARemembers.